A brief sketch of the relationship between the “Weir Brothers” and their love for the town of their birth. Left face of “The Jenner Weir Tankard”,with inscription to the memory of his brother, by Harrison Weir. Photo with permission of the Lewes Town Council. Photo by Tom Reeves. Right face of “The Jenner Weir Tankard”,with Award inscription to Harrison Weir for a win at Anerley in 1856. Photo with permission of the Lewes Town Council. Photo by Tom Reeves. Detail of Etching of the trophy offered at Anerley in 1856 as it appeared in The Illustrated London News on July 12 of that year, before being won by Harrison Weir, then subsequently dedicated to his brother. Detail: Left face of “The Jenner Weir Tankard” inscribed: In Memory of his beloved brother,John Jenner Weir, F.L.S.,F.Z.S., F.E.S.,born at Lewes, Aug 19th, 1822.. Photo with permission of the Lewes Town Council. Photo by Tom Reeves. Detail: Right face of “The Jenner Weir Tankard” with presentation inscription at top from Harrison Weir to the Corporation of Lewes. Centre inscription for being originally awarded to Harrsion Weir Esq, for the “Best Pens of Toys” exhibited at Anerley 1856. Photo with permission of the Lewes Town Council. Photo by Tom Reeves. Half page engraving as it appeared in the July 12th issue of the Illustrated London News, advertising the selection of Prize Plate offered to major winners who choose to enter the forthcoming Poultry and Pigeon Show at Anerley. The tankard eventually won by Harrison Weir in 1856 and later dedicated to his brother in 1894, is at top right. Detail: One of eight engravings from a page in the llustrated London News of August 9th 1856 and featuring Prize Winners from the Poultry and Pigeon Show at Anerley. 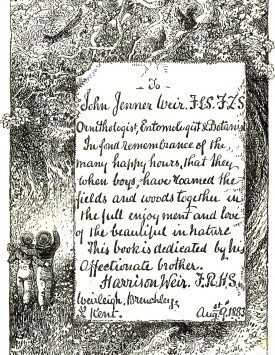 All the engravings were by Harrison Weir, including this one which featured his own winning class of Toy Pigeons. The “Harrison Weir Tankard”, originally presented to Harrison Weir by the Crystal Palace Company in 1871. Now part of the Civic Insignia of the Lewes Town Council. Photo with the kind permission of the Council. Photo by Tom Reeves. Detail of The “Harrison Weir Tankard”, showing the presentation inscription to the Corporation of Lewes in 1894. Photo with the kind permission of the Lewes Town Council. Photo by Tom Reeves. The “Harrison Weir Bowl”, originally presented to Harrison Weir by admiring Cat Fanciers in appreciation for his services in instituting the first Crystal Palace Cat Show in 1871. Presented to mark the 30th anniversary of that Show in 1901. Donated to the Corporation of Lewes, upon his death in January 1906. Photo with kind permission of the Lewes Town Council. Photo by Tom Reeves.